I’m not a huge fan of pork chops, because I always overcook them. I can never figure out the correct timing when I’m cooking them. BUT….using this method of broiling them, they were juicy and so good. I was a little concerned that the glaze would be a little spicy with the whole-grain mustard, but it wasn’t too spicy and added the right amount of flavor and a change from the boring and bland way I usually make them. Heat an oiled broiler pan 6 inches from the broiler element. In a small bowl, stir together the maple syrup, mustards and garlic paste to make a glaze. Season pork chops with salt and pepper. Place them on the pan and broil for 8-9 minutes on each side, turning once. 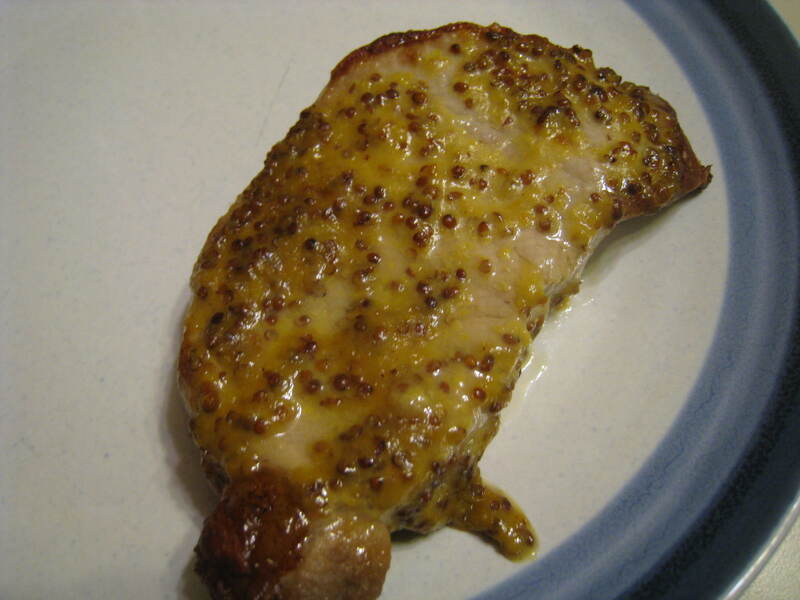 Spread the maple-mustard mixture on top of the chops and continue to broil until glaze is bubbly, about 2 minutes. Remove from broiler and serve.